We fell in love with Ubud. We visited briefly in November last year without the kids and had a great relaxing break. So once we said goodbye to our friends in Legian it seemed the natural place to head for our last 4 nights in Bali. We stayed our first night a the Jati 3 bungalows and although they were lovely and very well located on Monkey Forest Road, we required something with a little more space for the kids to roam and play. 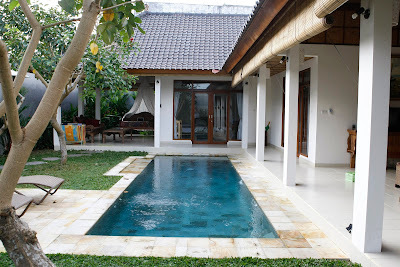 I jumped on trusty tripadvisor.com and searched for a vacation rental in ubud and a number of good value villa's came up. 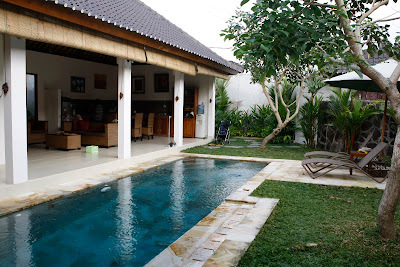 I soon learned that the majority of these villas were managed by Private Ubud Villas http://privateubudvillas.com. A lovely australian gentleman, Steven Castley answered my request and the following day we moved to the beautiful Villa Palm Merah. These 2 bedroom pool villas are luxury plus. The attention to detail that Steven has taken with these villas is second to none. The living space, dining and kitchen is all open aired which gives such a glorious feeling of freedom. We were super surprised how there seemed so few mosquitos in this environment. Much fewer than we experienced in Legian which seemed strange. We could have easily stayed put here for a couple of weeks if not months. The villa was perfect, the service which included a bellboy to clean the villa, service the pool and make breakfast for us all was great and Steve popped in a few times to make sure all was satsifactory. The area is full of yoga classes, meditation, alternative therapies and gorgeous fresh organic foods. The only spoiler was that our friend Nai decided to head back to her family in Thailand. We had hoped that she would continue with us on our travels to help with the children and give Joel and I a chance to have some R & R from time to time. Oh well, all things happen for a reason. We definately will be back to Ubud in the near future. I can totally understand why it featured in the Eat, Love and Pray story. It would be a perfect place to recover. We're looking forward to spending more time with you in Ubud. Hopefully, you'll stay the month at this lovely villa (since it's right around the corner from our house). I agree with you...Ubud is definitely a place to find your spirit again. Our journey has begun.